There are various numbers and ratings that reflect different capabilities of an air compressor. It can be confusing keeping track of what they all mean. Having a good understanding of these ratings helps you choose the best air compressor for your needs — so you can get the job done. CFM: Cubic feet per minute is the volume of air being delivered by the compressor to the air tool. This number is used as a measure of the compressor’s capabilities — and it’s the most important rating when choosing an air compressor. Compressors with higher cfm ratings provide more air, which makes them more practical for larger jobs. PSI: Pounds per square inch is the measure of air force delivered by the air compressors. The vast majority of air tools require psi of 40 or 90 to get the job done. DUTY CYCLE: Reciprocating air compressors are designed to operate in an on/off or cyclical manner. The relationship between on time and off time is called duty cycle. All compressors are rated for a specific duty cycle, such as 50/50 or 75/25. A 50/50 duty cycle compressor is designed to run 50 percent of the time, while a 75/25 duty cycle compressor is designed to run 75 percent of the time. GALLONS: This is a measure of tank size, which can be a factor when using tools that require a continuous flow of air, such as spray guns or sanders. The larger the tank, the longer a job can be done at the air tool’s required pressure before work must pause in order to rebuild pressure in the tank. HORSEPOWER (HP): Horsepower measures the work capacity of the motor or engine that drives the compressor pump. Although horsepower is the most readily recognized rating by the consumer, it is also the most misleading. As a general rule, the higher the horsepower, the greater the CFM output. The most common air compressor ratings are cfm and scfm (standard cfm). So, what’s the difference? 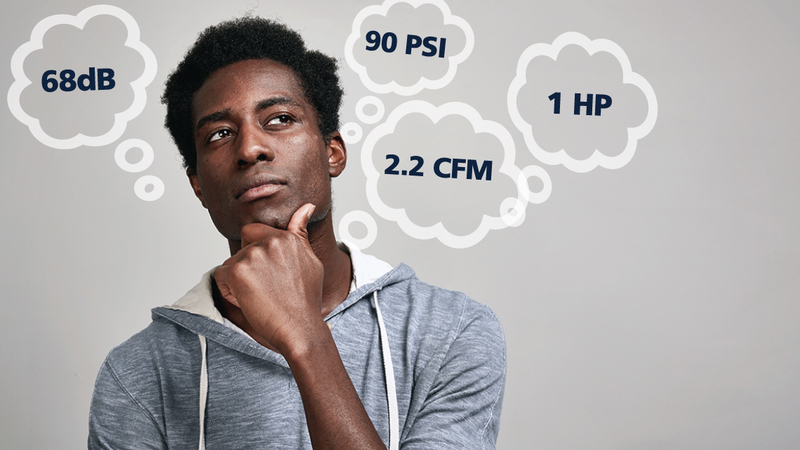 As a measurement, cfm will be a smaller number than scfm, because cfm values are taken under pressure (typically 90 psi), so the air volume is small. To calculate scfm, the air is expanded to a standard condition to take into account the variables of pressure, temperature and humidity: 14.7 psia (0 psig), 68 degrees Fahrenheit at 36 percent relative humidity. As a result, scfm values are larger. Campbell Hausfeld typically uses cfm values when talking about air compressors and scfm values when talking about air tools. Campbell Hausfeld realizes that typical DIY users do not run their tools non-stop. Therefore, our air consumption ratings are based on an average usage or duty cycle. Average usage is based on the amount of time in an hour that the tool will typically run. Campbell Hausfeld rates air consumption in this manner to give a better indication of the approximate size air compressor needed for the tool to complete typical tasks — and by the average DIY user. For best results, consider the tool that you anticipate using with the highest scfm rating and purchase a compressor with an output of 1.5 times that rating. For example, if you plan to use an impact wrench that requires 5.8 scfm, you would want to purchase an air compressor that puts out at least 8.85 cfm. If you plan to supply multiple tools simultaneously with compressed air, add the scfm requirements for all air tools and multiply by 1.5. Explore our numerous air compressor options to find the best air compressor for your needs.